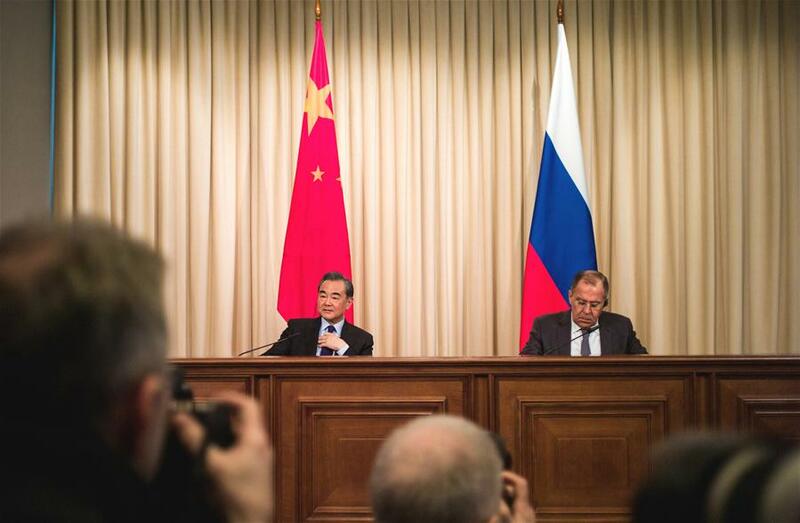 MOSCOW, April 5 (Xinhua) -- Chinese State Councilor and Foreign Minister Wang Yi said here on Thursday that the United States' protectionist trade policies will affect the development of the world trade and economy, and the international community should jointly boycott such moves of unilateralism to maintain the global economic growth. The recent move by the United States has violated the rules of the World Trade Organization (WTO), which posed a threat to the foundation of the global trade system and will certainly impact the normal development of the world trade and economy, Wang said at a press conference after talks with Russian Foreign Minister Sergei Lavrov during his visit in Russia as the special envoy of Chinese President Xi Jinping. The U.S. administration on Tuesday announced a proposed list of products subject to a suggested tariff of 25 percent, which covers Chinese exports worth 50 billion U.S. dollars. In response, China on Wednesday unveiled a list of products worth 50 billion U.S. dollars imported from the United States that will have an additional tariff of 25 percent imposed on them, including soybeans, automobiles and chemical products. As a sovereign nation with legitimate right of self-defense and a firm supporter of global trade mechanism, China is forced to take necessary countermeasures against the U.S. tariff proposals, Wang said. The top Chinese diplomat said the United States made a wrong judgement for assuming that it could gain benefits out of protectionism and therefore made a wrong decision in slapping trade sanctions against China, while the two deeply integrated economies should have shared mutual respect and treated each other as equals. In the context of the fragile growth of global trade, the United States in applying its "America First" policy frequently waged trade wars around the world, which is a typical action of unilateralism and a defiant expression of economic hegemony, Wang said. Therefore, it is imperative for the international community to boycott such acts of unilateralism that ignore the rules, in a joint effort to make those who think they can get their own way come to their senses and safeguard the hard-won growth momentum of the world economy, he added.